This past summer I could not make it to ISTE. Because of the efforts of the #notatISTE crew, I felt intimately connected to the conference. The same opportunity will be available for AASL National Conference this coming week. 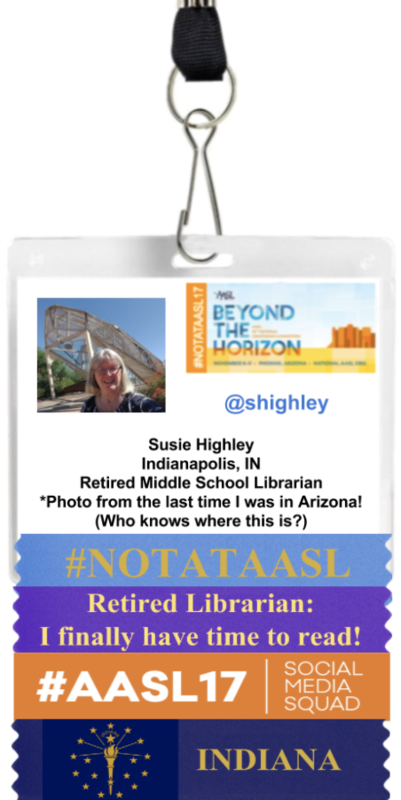 Post about the conference: Respond to posts with comments and questions, and use the #NOTATAASL hashtag to let people know you are there “virtually.” Also, search for this hashtag. You can add it to your OR search. #NOTATAASL LiveBinder: Visit the NOTATAASL LiveBinder website at bit.ly/notataasl, set up for us by Peggy George, which will serve as a “home base” for virtual attendees. During the conference, Peggy and Susie Highley will be curating links to shared presentation resources and blog posts, live streams and recordings from sessions and events, AASL Standards resources, and more. And, it already includes a wealth of information about the conference, including social media feeds, links to follow the conference social media squad members and AASL’s Social Media Superstars, #NOTATAASL challenge information, and more.